In today’s tech world there are millions of applications and free tools on the internet for just about anything you could ever possibly want or need. 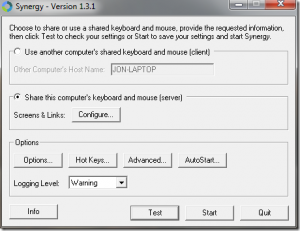 This article is about a great little tool called Synergy that allows you to share a single mouse and keyboard across multiple computers and monitors. Are you using synergy to connect multiple computers with one keyboard and mouse on your laptop or in a situation where different computers are constantly being moved around? If so then you’ve probably seen the popup window that says “WARNING: failed to connect to server: no address for:” and if you’re anything like me then that popup drives your crazy, especially on the laptop. Well I finally got tired of seeing it all the time and did a few searches on the net to see if I could figure out how to make it stop but I couldn’t find anything so I started experimenting with it myself and found the solution to be quite easy.